Manager Gabe Kapler can only do so much with his two most experienced arms on the DL and a struggling Hector Neris. In the beginning, there was a closer, and the closer was Hector Neris, and Gabe saw it was good and said it was good. It's important to remember this, now that the Phillies' bullpen and Gabe Kapler's use of it have become such sources of frustration and discussion. Kapler has generally tried to use his most effective relievers – Seranthony Dominguez, mostly – in the highest-leverage situations, and he has generally eschewed the traditional practice of assigning defined and immutable roles to the bullpen's members. Who is the Phillies' closer? Who is their eighth-inning reliever? Who is their long man? Kapler has been reluctant to specify. But at the beginning of this season, there was a closer, Neris, who had saved 26 games for the Phillies last season. And on opening day, Kapler had Neris pitch the bottom of the ninth inning in a tie game against the Braves in Atlanta, which is exactly what a manager ought to do with his closer in the bottom of the ninth inning of a tie game on the road. And so Gabe did see that having a designated closer was good, and he did, in effect, say it was good. Neris allowed a three-run home run to the Braves' Nick Markakis, and all the subsequent hubbub over Kapler's yanking Aaron Nola after just 68 pitches that day obscured the more meaningful repercussions of the loss. For Neris, that performance was a tone-setter. He pitched so terribly over his first 30 appearances that Kapler and the Phillies determined not only that Neris could no longer be their closer, but that he needed a stint at triple-A Lehigh Valley to refine his mechanics and clear his mind. Such are the perils of an unproven bullpen – and one that has been touched by injuries to the two pitchers who, entering this season, were its most experienced members. Tommy Hunter started the season on the disabled list, and Pat Neshek hasn't thrown a pitch in the majors yet. It's fun and easy to play the what-would-you-have-done guessing games that naturally arise when, say, Kapler chooses to have Dominguez intentionally walk 19-year-old phenom Juan Soto to face Daniel Murphy. It's a hell of a lot harder to be a manager whose best bullpen option in the here and now is a rookie with all of 20 major-league appearances. Seranthony Dominguez was called up in early May and has only 20 appearances in the majors under his belt. That's why giving yourself a migraine arguing over which Phillies reliever should pitch in what inning to what hitter is pretty much pointless. 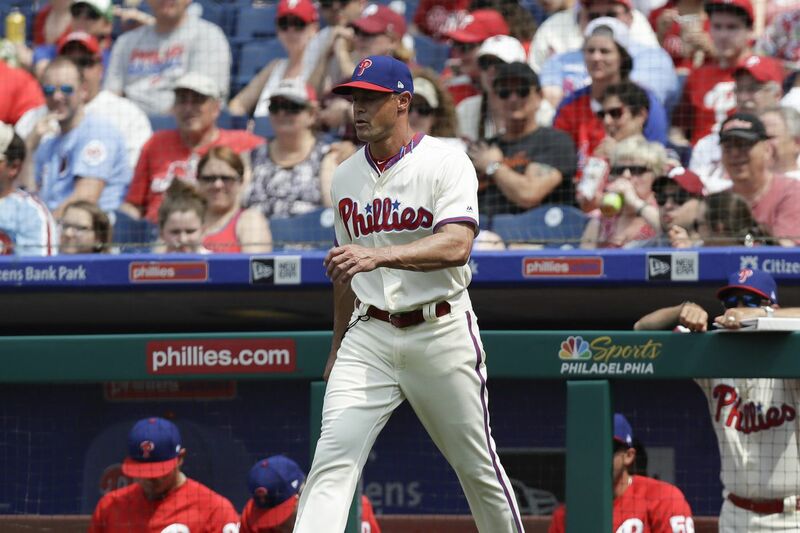 Until Neshek returns from the disabled list or general manager Matt Klentak manages to acquire another arm or the relievers already here start pitching better, Kapler will continue to be engaged in a mad grab for outs anywhere he can find them. He doesn't have the luxury that, for instance, Yankees manager Aaron Boone has, and the Yankees' 4-2 victory Monday was a clear example of the difference between the bullpen stability that they have long had and that the Phillies lack. It might have offended old-time baseball sensibility for Boone to have removed starter Jonathan Loaisiga after Loaisiga had pitched 5 1/3 scoreless innings and held the Phillies to one hit. But look at the arms Boone had at his disposal: first David Robertson, then Dellin Betances, then Aroldis Chapman, each of whom has been an effective and accomplished reliever for at least four major-league seasons. For more than two decades, the Yankees have either developed such talent in their farm system or spent the money and resources to acquire it, which in turn has allowed them to deploy their relievers however they chose. They chose to stay traditional because they had the depth to do so. They didn't use Mariano Rivera in high-leverage situations in regular-season games the way Kapler has used Dominguez. Rivera pitched the ninth whenever the Yankees had a close lead. He might the eighth, too, but as not frequently. The Yankees counted on other relievers to shepherd a game to him, and those relievers often did. Similarly, on Monday, Boone waited to use Chapman until there were two outs in the eighth. "If we had Mariano Rivera, if it was Mariano Rivera circa 2004, he'd probably be our closer," Kapler said. "I would be tempted to use him in the way that was best for the Phillies. But given what he had accomplished in his career – and this is total speculation – he'd probably be most comfortable in the ninth inning, and we'd probably use him where he was most comfortable." That was an interesting admission by Kapler: that for all his belief in fluidity and versatility, he would, in particular situations, be open to deferring to a reliever's preference for a narrowly defined role. Maybe Rivera, the greatest relief pitcher in major-league history, is sui generis for him that regard. Maybe not. We won't know until one or more of the Phillies' relievers earn enough of Kapler's trust for him to consider the question. "To get from Point A to Point B, usually you develop in various ways," he said. "Usually, you're not just inserted from double A into the big leagues and [told], 'Now you're a closer for the next 15 years.' … These guys are young on the calendar, and they're young in their development, too. So they're developing into roles." Sometimes, you're inserted from triple A into the seventh inning against the Yankees. It happened to Hector Neris on Monday. He needed just 13 pitches to retire the three hitters he faced, striking out two of them. Everyone saw it was good and said it was good, and it was good. But there's still a long way to go, for him and the Phillies and their bullpen. >>READ MORE: Why does Carlos Santana use so much pine tar?